A superb example of the bookmaker's and translator's art, this new edition of Plato's Symposium exhibits aesthetic, literary, and intellectual excellences rarely found together in a single volume. 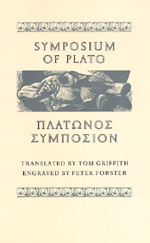 Tom Griffith's translation of this foundation work of Western culture is unsurpassed for the balance it achieves between readability and fidelity to Plato's Greek. For felicity of phrasing, freshness, care to match the sense of the Greek rather than its wording, and for its idiomatic rendering of the spoken word, it has no peer. Originally published in a limited edition with facing Greek and color wood engravings, Griffith's translation is here presented in reduced format that retains the aesthetic quality of the original version at an affordable price. One of three classicist sons of a classicist father, Tom Griffith has recently turned from teaching to publishing and bookmaking—and translation.